How much damage do you think you can do in just 8 working sets? You're about to find out. Mentally prepare yourself, then leap into this classic lower-body routine from The Shadow himself! These days, brag-worthy leg workouts seem to share a common theme: volume. Squats, lunges, extensions, and other machines all get dosed out in such immense quantities of sets and reps that "leg day" begins to feel like a literal description. By the time you're done, you might be the only person in the gym. Let Dorian Yates show you an entirely different way. 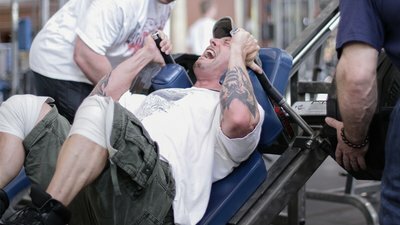 In this classic workout from Dorian Yates' Blood and Guts 6-Week Trainer, the six-time Mr. Olympia makes every single rep mean something, and pushes Kris Gethin—no slouch when it comes to effort—to his absolute limit. Think you can only handle one more? Dorian can get you to four. But it'll hurt. If you're heading out to train legs, the two-part video is about the best motivation you could find. And if you're the only person in the gym at the end of this routine, it's because everyone else fled in terror of what you just accomplished.